Sen. Ted Cruz (R-Tex. ), left, a contender for the Republican presidential nomination, with NORPAC president Ben Chouake at its April 18 fund-raiser. 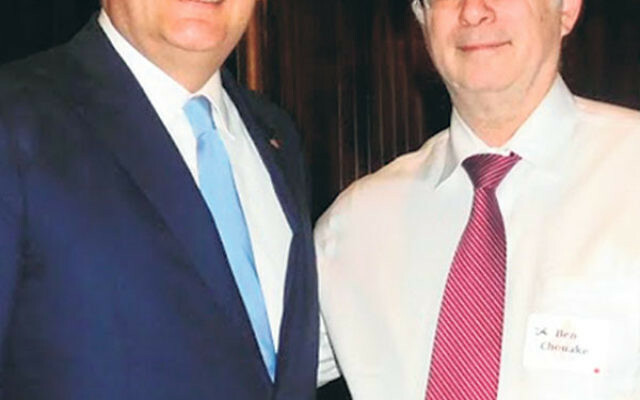 On the eve of New York State's presidential primaries, Republican hopeful Ted Cruz received an estimated $250,000 in campaign support at an April 18 benefit hosted by NORPAC, the New Jersey-based nonpartisan pro-Israel political action committee. A day later, Cruz finished in last place in the Republican primary, winning only 14.5 percent of the vote. Ohio’s Gov. John Kasich finished second with 35.1 percent, and New York builder Donald Trump swept the state with 60.5 percent. The sum was more than double the amount the senator from Texas received last Dec. 9 at a NORPAC breakfast fund-raiser in Englewood, but less than the $400,000 earned when the group held an event for Democratic contender Hillary Clinton at a Jan. 14 fund-raiser in Manhattan. NORPAC has held no benefits for Republican candidates Trump and Kasich or Democrat Bernie Sanders. 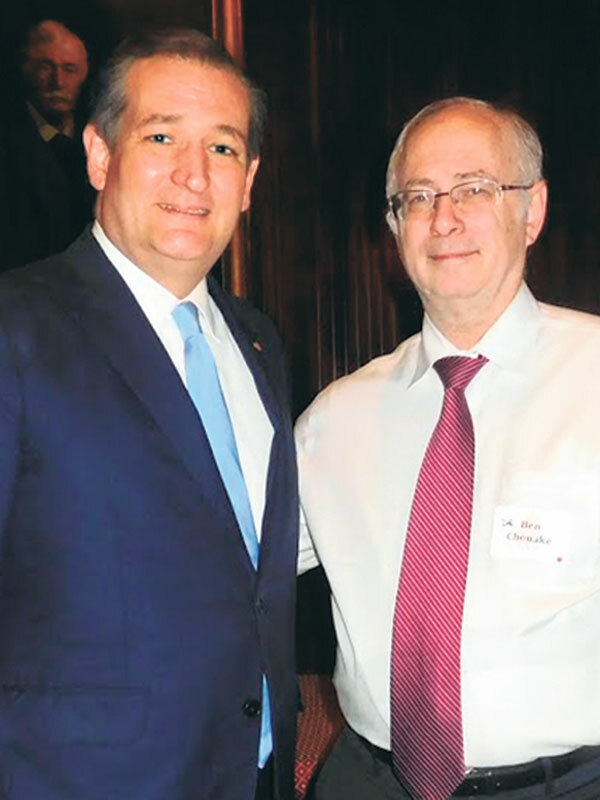 The morning after the gathering with Cruz at the Harvard Club in Manhattan (the candidate is a 1995 graduate of the university’s law school), NORPAC president Ben Chouake of Englewood told NJ Jewish News that “he spoke well, and everybody understood his support of our issues. A lot of the discussion was about his strategy for winning the Republican nomination, but he spent most of the time saying hello to the 200 people in the room and thanking them for their support. A lot of them had been with his campaign for a while,” said Chouake, a delegate who will be supporting Cruz at the Republican National Convention in July.